It is always nice to visit that beautiful iconic scene and come back with something that just makes you proud but we always want a little more don’t we? I have noticed while standing in these famous spots my head wants to pull a 360 like an owl, looking for more rodents to eat. When you are visiting an iconic location always look for prominant object such as mountains or certain rock formations. Some places you might have to go searching further than others but you can eventually find a nice viewpoint. 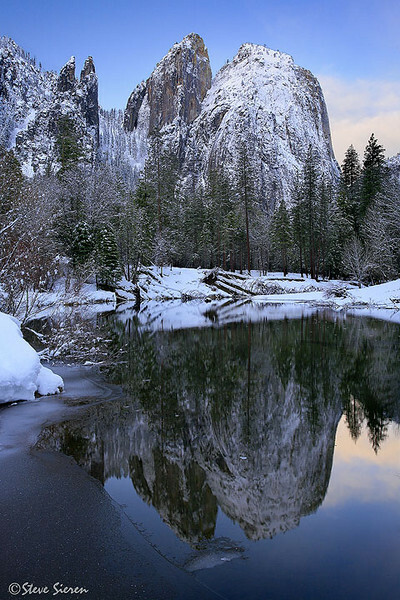 This El Capitan photograph from the snowy winter banks of the Merced in Yosemite is one location in particular. You can find two newer iconic scenes over either of your shoulders, I’m not kidding the second photo is the Three Brothers over my right shoulder and over the left shoulder is the Cathedral Spires in the last photo. Both scenes are very worthy of being called iconic and you won’t have to go far to get them. 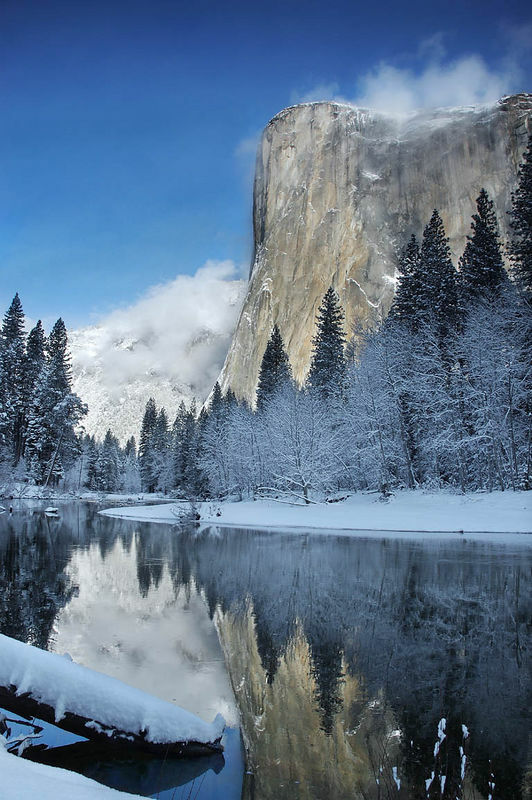 Just put them on your to do list while there in Yosemite. I’m not kidding, literally right over my right shoulder when looking directly at El Capitan along the Merced. The Cathedral Spires over my left shoulder. 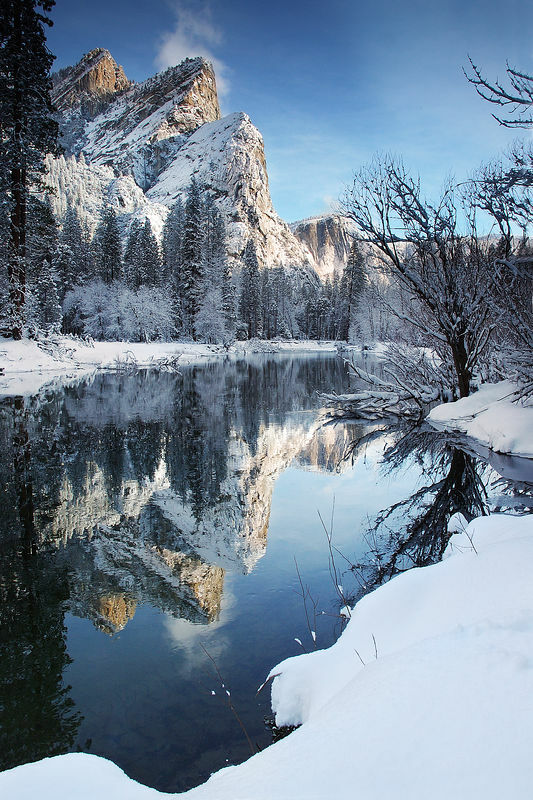 This is some of my older work, I hope to share some of my newer Yosemite winter shots soon… .. . This entry was posted on January 6, 2010 at 7:49 pm and is filed under Uncategorized. You can follow any responses to this entry through the RSS 2.0 feed. You can leave a response, or trackback from your own site. I have been here twice and didn’t even know that this was where you took your beautiful Three Brothers shots. I really should have guide me around sometime but I’m still way too much of beginner. This is a great post, and something that dovetails so well with what I’ve been thinking about lately. Its important, I think, to either look for new views of new icons, or re-interpret the classics photographically. You had better light on the 3 Brothers than I did! Also…all that was over my left shoulder were trees–how did you see the Cathedral Spires that clearly from that location on the river? Beautiful! I really love the snowy reflections on the last two images. Greg, reading your post sparked the idea here and I look forward to the follow up on your last post. I don’t know why I’ve heard the same problem from so many people about the brush. Maybe it was not as thick when I went out there, these were were taken about 3 or 4 years ago. The shore could of been further in as well. Jenny, it’s never too soon. From what students have mentioned they can only retain so much so it’s best to just take a few small steps forward and master those. Most cramming fades out of memory quicker than you think. When you’re ready I’ll be here. Love the pristine conditions Steve. Yosemite has so many icons that I can’t even identify them all. Hi, Steve. The follow-up to my blog is written, will go live tomorrow at Noon PST. I’m leaving in the morning to shoot in Utah, but would love to continue this discussion over email, or in blog-land. That’s great to know Steve! Have to remember that when visiting Yosemite NP in the summer. Outstanding series of winter magic buddy. Even though El Cap stands majestic as ever, I must say that I find the 3 Brothers displayed in such a fantastic way as you did even more appealing. I have long been a proponent of iconography, as I call it. There is almost always a fresh way to photograph an icon and, as you have shown, there may well be new icons right next door waiting to be discovered. Excellent post, Steve. Thanks David, it can be a little trick to find but if you use El Capitan as the guiding landmark you can’t miss it. The three brothers shot is spectacular, Steve.